Restricted cash represent proceeds received from the Rights Offering which were held in escrow as of March 31, 2013. The amount was made available for use by the Company in its operations in April 2013. During the six months ended March 31, 2013, the Company’s investment in the common stock and warrants of OER, a Canadian oil and gas company that trades on the Toronto Stock Exchange (TSX) increased in value by $29,280. This increase in value is included as an increase in stockholders' equity in accumulated other comprehensive income. During the six months ended March 31, 2013, the Company recognized compensation expense of $10,898 related to options granted to the Board of Directors and Officers in fiscal year 2012. As of March 31, 2013, there are 4,150,000 options outstanding; none of which are exercisable. 600,000 options were forfeited during the period. These options have a weighted average remaining term of nine months and an intrinsic value of zero. Unamortized compensation cost related to these options amounted to $20,874 which is expected to be recognized over the remaining nine months vesting period. During the six months ended March 31, 2013, there were no new warrants granted and none were exercised, cancelled or expired. As of March 31, 2013, the Company has 13,777,729 outstanding and exercisable warrants with a weighted average exercise price and remaining term of $0.32 per share and 1.96 years, respectively. As of March 31, 2013, these warrants have an intrinsic value of zero. As of March 31, 2012, ERHC paid in full the requisite signature bonus of $310,000. ERHC is committed under terms of the PSC to spend at least $10,250,000 over the first two years on a minimum work program and an additional $30,000,000 in each of the following two periods of two years each. Additionally, under the terms of the PSC, during the initial exploration term of two years that started in the first quarter of 2013, ERHC will pay surface fees of $54,000 per year and annual training fees of $175,000 per year. During the quarter, ERHC paid these fees for the 2013 to the government of Kenya. Spend at least $15,000,000 over the first five years on a minimum work program and at least an additional $1,000,000 over a further period of up to three years. Pay surface fees of $27,000 per calendar year during the first validity period, and lasting for up to eight years. Surface fees for subsequent periods will depend on the exploration progress as well as on the acreage retained by ERHC. As of March 31, 2013, particular milestones are outstanding including certain financial obligations as provided in the PSC, as indicated above. Management is currently pursuing the formal extension of timelines for the commencement of the work program and meeting of pecuniary obligations under the PSC with the Government of Chad. The formal timeline extensions will enable the conclusion of administrative and other obligations on both sides (including the setting up of a management committee for the exploration) that are a pre-requisite to the effective execution of ERHC’s PSC commitments. Proceedings on the suit and the arbitration are currently suspended while the Company pursues amicable settlement with the Governments of Nigeria and Săo Tomé & Príncipe. As of March 31, 2013, the suit and arbitration remained suspended while the Company continued to pursue settlement. ERHC is now pursuing a similar approach for JDZ Blocks 5, 6 and 9 as well as for blocks in the EEZ. Drill one (1) well to a minimum depth of 3,000m (at an approximate cost of US $ 30,000,000). As of March 31, 2013, ERHC was preparing for the rollout of activities on its exploration work program in Kenya Block 11A and simultaneously entertaining discussions with other companies interested in farming into the Block. Subsequently, on May 5, 2013, the Company announced that it had signed a letter of intent with an integrated international oil and gas company for a farm-out of part of the Company’s interest in the Block. The Company’s potential partner is a renowned multinational operator with exploration and production interests spread across several continents. The parties are proceeding to negotiate the definitive terms for a farm-out. Any agreement reached will be subject to the approvals of the respective boards of both companies and of the Government of Kenya. 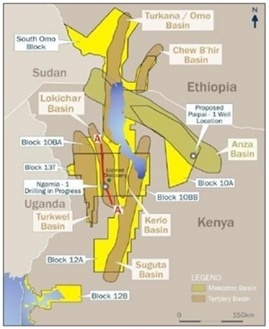 Until a definitive farm-out agreement is entered into and approved, ERHC continues to operate Kenya Block 11A. ERHC’s work program under the PSC is continuing apace. The Company is currently reviewing bids from several service companies for process management and execution of a Full Tensor Gravity Gradiometry (FTG) survey of the Block. The FTG survey is an airborne survey that aids significantly in the structural mapping of prospective hydrocarbon basins. It has contributed to some recent, commercial oil discoveries in Uganda and Kenya. Prior to the commencement of EIA and FTG activities, ERHC expects to hold a town-hall meeting with local communities and other stakeholders within the Block to explain the proposed activities. ERHC will convene the meeting in conjunction with the Kenyan Ministry of Energy. The country covers almost 1,284,000 km2 and is situated in what has become a golden triangle of African oil production. 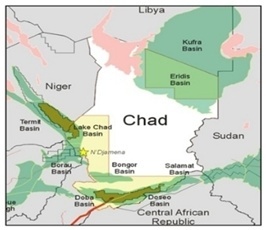 Chad is bordered by Libya, Nigeria and Sudan which are among Africa’s largest producers of crude oil. 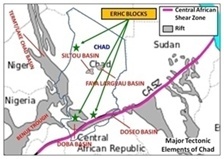 Cameroon which borders Chad in the South West is also a net exporter of crude oil..
ERHC plans to focus its work program initially on the BDS 2008 and Chari Ouest III Blocks in Southern Chad. 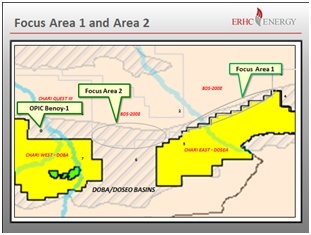 ERHC’s holdings in the two Blocks encompass 20,860 square kilometers or 5.155 million acres. 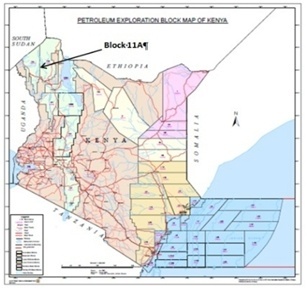 Both Blocks are located on the north flank of the Doba/Doseo basin, where Esso and partners have been active in exploration and development projects in the area for decades. ERHC recently invited eligible contractors to submit expressions of interest in providing Environmental Impact Assessment (EIA), gravity/magnetic and seismic acquisition services in the focus area. Furthermore, the proximity of the Chad-Cameroon pipeline to these blocks provides necessary infrastructure for the exploitation of potential oil and gas reserves. 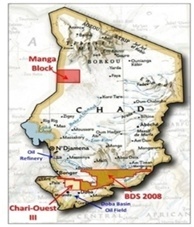 On July 6, 2011, the Company announced that it had signed a Production Sharing Contract (PSC) on the three oil blocks with the Government of Chad. A PSC is an agreement that governs the relationship between ERHC (and any future joint-venture partners) and the Government of Chad in respect of exploration and production in the Blocks awarded to the Company. The PSC details, among other things, the work commitments (including acquisition of data, drilling of wells, social projects, etc. ), the time frame for completion of the work commitments, production sharing between the parties and the Government, and how the costs of exploration, development and production will be recovered. The PSC requires a signature bonus of $6 million, $1 million of which was paid upon transmittal of an Approval Law by Chad to ERHC in July 2011, $4 million are due within 90 days of the later of (a) a publication of the Approval Law in Chad’s official gazette and (b) a notification of ERHC of the Award Order, and $1 million is due 120 days after the date of transmittal of the Approval Law to ERHC. ERHC is currently pursuing the formal extension of timelines for the commencement of the work program and meeting of pecuniary obligations under the PSC with the Government of Chad. 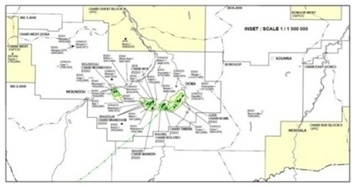 The Company’s proposed 2013 work program in Chad will concentrate on two focus areas in BDS-2008 with the goal of identifying leads and prospects for future drilling. Focus area 1 is situated directly north of the Tega and Maku oil discoveries made by Esso in the 1980s and focus area 2 is situated directly east of recent discoveries made by OPIC. Regional stratigraphic mapping indicates the presence of alluvial fan deltas and lacustrine deltas in ERHC’s areas of interest, which provide both reservoir and seal rocks. As in Kenya, the Company plans to pursue rift margin plays in Chad similar to those that led to recent major discoveries in East Africa. ERHC’s current plans are to conduct a Full Tensor Gravity Gradiometry (FTG) survey over these focus areas. Prior to this an environmental impact study will be performed. As of March 31, 2013, management was pursuing the formal extension of timelines for the commencement of the work program and meeting of pecuniary obligations under the PSC with the Government of Chad. 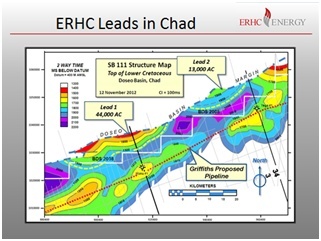 ERHC’s work program in Chad for 2013 and 2014 has subsequently been approved by the government of Chad. The work program involves a Full Tensor Gravity Gradiometry (FTG) survey to define the major structural elements of ERHC’s BDS 2008 block, which is the focus block for the approved work program. The FTG will be preceded by an Environmental Impact Assessment (EIA) of the focus area. FTG acquisition measures minute changes of the earth's gravity caused by differences in density in the local geology. When combined with known geologic information, FTG data will be used to assess geological structures. This activity will help the Company better identify potential leads and prospects and help determine where future additional 2D seismic acquisition is required. The Company awaits a final decision between the remaining parties to the PSC and the Joint Development Authority on how exploration in Blocks 2, 3 and 4 will proceed and the Company expects that decision could be made public at any time. The three potential courses of action are entry into Phase 2 of the exploration program, further extension of Phase 1 or a withdrawal by some or all of the remaining parties from the PSC and relinquishment of the acreage. The Company intends to remain in the three Blocks and to retain its other interests in the JDZ. PSC negotiations between the national petroleum agency of Săo Tomé and Príncipe (ANP-STP) have reached an advanced stage in respect of Block 4 of the EEZ. ERHC is also seeking to actuate negotiations in respect of Block 11 of the EEZ. On December 27, 2012 the Company filed a prospectus supplement with the Securities and Exchange Commission in respect of the rights offering, ERHC distributed on a pro rata basis to the holders of its common stock one non-transferable subscription right for every three shares of common stock owned as of the close of business on the previously announced December 17, 2012 record date. Each subscription right (with the total number of subscription rights issuable to a holder rounded down to avoid the issuance of fractional rights) entitles its holder to purchase one share of the Company’s common stock at a subscription price equal to $0.075 per share. In addition, holders of subscription rights who fully exercise all of their subscription rights may also request to purchase additional shares of the Company’s common stock that remain unsubscribed at the expiration of the rights offering, subject to the availability and pro rata allocation of shares among rights holders exercising such over-subscription right. The Company offered 246,486,285 shares of its common stock in the rights offering, representing approximately 33 percent of its outstanding shares of common stock. The rights offering was initially supposed to terminated on January 31, 2013 but was extended to February 28, 2013 and then to March 15, 2013. The Rights Offering resulted in net proceeds to the Company of $1,540,178 from the exercise of approximately 22,000,000 subscription rights (including certain oversubscription privileges). The Company plans to apply capital raised in the rights offering to fund specific exploration and development activities pursuant to work programs governing its exploration acreage in the Republics of Chad and Kenya, as well as for general corporate purposes and working capital needs. General and administrative expenses decreased from $1,173,139 in the three months ended March 31, 2012 to $839,723 in the three months ended March 31, 2013. Both periods reflect a normal level of expenses with decreased consulting expense in 2013. During the three months ended March 31, 2013, the Company had a net loss of $878,481 compared with a net loss of $1,173,625 for the three months ended March 31, 2012. General and administrative expenses decreased from $2,213,238 in the six months ended March 31, 2012 to $1,857,313 in the six months ended March 31, 2013. The decrease is due to ongoing efforts to cut general and administrative expenses. During the six months ended March 31, 2013, the Company had a net loss of $1,920,669 compared with a net loss of $2,216,099 for the six months ended March 31, 2012. As of March 31, 2013, the Company had $4,412,522 in cash, cash equivalents and positive working capital of $2,329,173. Management believes that this cash position should be sufficient to support the Company’s working capital requirements for more than 12 months. The Company also had $1,645,468 in restricted cash, the resulting proceeds from the right offering. The restricted cash may be applied to the Company’s exploration work programs as well as general purposes and working capital needs and has been included in the calculation of the working capital amount above. At March 31, 2013, the Company had no off-balance sheet arrangements. At March 31, 2013, the Company had a total of $4,577,079 in short term obligations, including a $4,000,000 signing bonus due under agreement with the government of Chad, $108,850 in accrued executive unused vacation, $100,500 in accrued executive bonuses related to acquisition of Chadian Blocks, payment is deferred until the Blocks are monetized, $27,702 in accrued salaries, $49,843 in accrued compensation owed to directors for serving on the ERHC board, and $248,743 of accounts payable. The Company’s current focus is to exploit its primary assets, which are rights to working interests oil and gas exploration blocks in Kenya, Chad, the JDZ and EEZ under agreements with the governments of Kenya, Chad, the JDA and the government of STP respectively. The Company intends to continue to form relationships with other oil and gas companies with operational, technical and financial capabilities, to partner with the Company in leveraging its interests. The Company currently has no other operations. As of March 31, 2013, all the Company’s exploration and production acreages were located outside the United States. The Company’s primary assets are agreements with Kenya, Chad, STP and the JDA which provide ERHC with rights to participate in exploration and production activities in Kenya, Chad, the EEZ and the JDZ in Africa. This geographic area of interest is controlled by foreign governments that have historically experienced volatility of which is out of management’s control. The Company’s operations and its ability to exploit its interests in the agreements in this area may be impacted by this circumstance. The Company’s Chief Executive Officer and Principal Accounting Officer participated in an evaluation by management regarding the effectiveness of the Company’s disclosure controls and procedures (as defined in Exchange Act Rules 13a-15(e) and 15d-15(e)) as of March 31, 2013. Based on their participation in that evaluation, the Company’s Chief Executive Officer and Principal Accounting Officer concluded that as of March 31, 2013, our disclosure controls and procedures are effective and ensure that the information required to be disclosed in the reports that ERHC files or submits under the Exchange Act, is accumulated and communicated to our management; including our principal executive and principal financial officers, to allow timely decisions regarding required disclosure under the Exchange Act. ERHC officers also concluded on March 31, 2013 that our disclosure controls and procedures are effective in ensuring that information required to be disclosed in the reports that we file or submit under the Exchange Act is recorded, processed, summarized and reported, within the time periods specified in the SEC rules and forms. There was no change in the Company’s internal control over financial reporting (as defined in Exchange Act Rules 13a-15(f) and 15d-15(f)) that occurred during the fiscal quarter ended March 31, 2013 that has materially affected, or is reasonably likely to materially affect, the Company’s internal control over financial reporting.